The people in these twelve stories don’t lead what you might call ordinary lives. Levi is not too sure what’s going on when he gets the cryptic message that states, Mr Calidinori is an alian monster from Mars. This is so true. Pass it on. All he knows is that whoever sent it can’t spell… and is either staging a wind-up or is not quite right in the head. Or – but the third possibility is just too weird for words. How would you feel if you found out, quite by accident, that you weren’t exactly human? That’s what Serendipity Creed wants to know, and she’s not about to leave until she’s told the whole story. Jake has a journal and it’s just as well. No one else would believe the weird things that happen after Jake accidentally gets posted to Antarctica. Paul and Marla are not too keen when Dad house-swaps them to an ancient inn. And that’s before the mysterious strangers start arriving. Do ghosts eat oranges? Red is on holiday at Seaharbour when she sees the ghostly ship. Other people are content to leave it alone, but not Red. Evie and Dyl have enough problems when the aliens invade without Dyl being photosensitive as well. Polly Fitzwater joined the Spacehawks for adventure. She is not pleased to find herself scrubbing floors. Dad has a habit of springing surprises on Nick and Jessy and their stepsister Pip. The one in Great Aunt Martha’s house is the most peculiar yet. The pirate ship Red Queen sails into the bay and the pirates are eager to hit the town. But someone has to stay with the ship. The pirates are counting on it. Jasper B Jarman has a double, and it’s getting him into trouble. That’s bad enough, but before he knows it, the double is trying to take over his life. 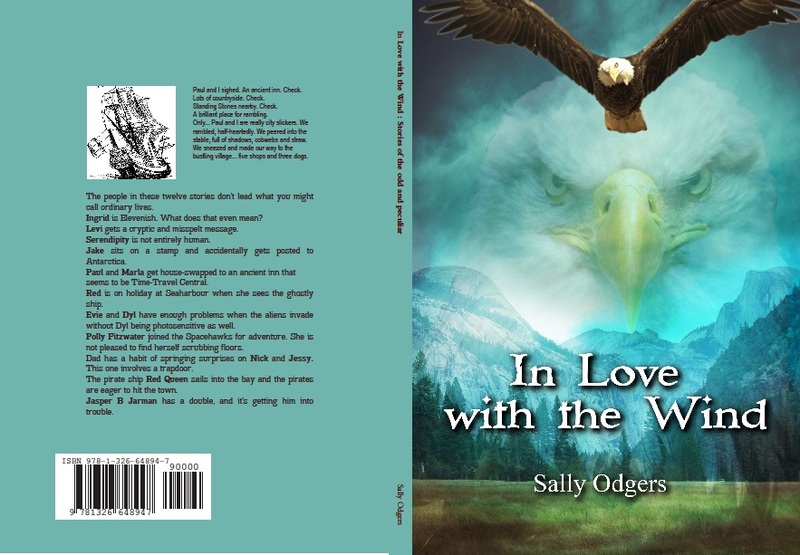 In Love with the Wind: Stories of the odd and peculiar is available through this link for $15.00. It will be available through Amazon once approved.